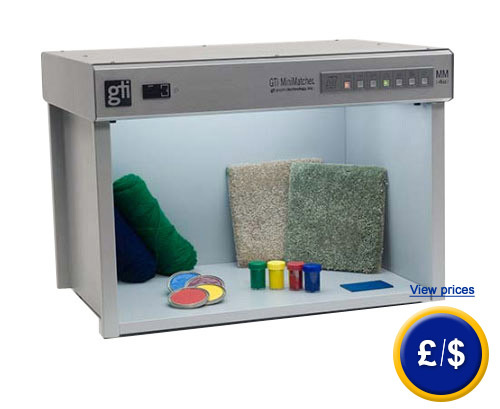 The colour rating cabin GTI MM-4e enables a visual measurement and comparison of colour. Therefore the colour rating cabin has implemented five different shades of light. These allow an accurate simulation, so that also the rating afterwards can be analyzed as accurately as possible. Thus the light situation can be clearly stated by the colour rating cabin GTI MM-4e and metamerism can be detected. The light unit can be switched via the digital control panel of the colour rating cabin GTI MM-4e. Furthermore that control panel is easy to program in order to feed-in an event frequency that can be started via key press. The mentioned automatic event frequency is featured by the colour rating cabin in order to generate a fixed observation-time for every type of light, so that the process is kept the same. The colour rating cabin is applied anywhere, where colour-wise correct products are manufactured, which shall hold the same colours, so that an optimal product of high-quality can be generated, which does not alternate in its colouring regardless of the location, it is applied at. Therefore the colour rating cabin comes with different shades of daylight, which can be simulated in order to avoid metamerism. The hour meter for the standard light source that is featured by the colour rating cabin, allows indicating the used and spare tube hours. If there are any questions about this colour rating cabin GTI MM-4e, please have a look at the technical specification below or call: UK customers +44(0) 23 809 870 30 / US customers +1-410-387-7703. Our technicians and engineers will gladly advise you in all color light cabins and all products in the field of measuring instruments, regulation and control and scales.